Revealed: A Massive 7.4% Dividend From … Bank Stocks!? If you’ve held off on bank stocks for the last few months, I have good and bad news for you. The good? You’ve still got time to get in before the banks take off on their next surge. The bad? After the big profits this hated sector has posted in the last couple weeks, your window is closing fast! 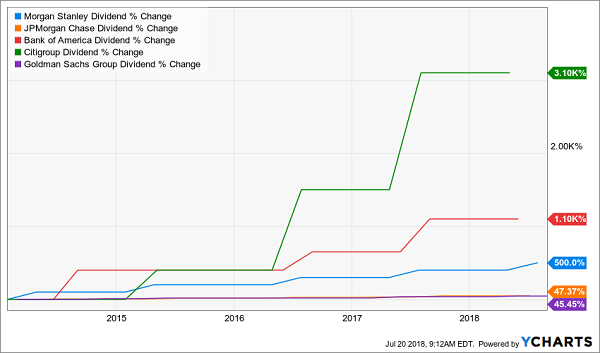 So today we’re going to look at why 5 of the 6 biggest US banks look strong now … but being the dividend hounds we are, we’re not going to buy “regular” bank stocks, with their pathetic sub-2% dividend yields. Because we want the bulk of our profits in cash, not fly-by-night paper gains. And that’s what you get in the off-the-radar buy I’ll reveal at the end of this article. It’s a dirt-cheap fund that taps straight into the big banks’ profits, then hands them to you as a 7.4% dividend. Don’t worry, this fund still has upside, too, with a baked-in price gain of at least 9% (and likely more) in the next six months. More on this unusual fund shortly. First, let’s take a look at why the big banks are worth a second look now. The chart below shows us that after shunning banks since the start of 2018, first-level investors are starting to clue in that these stocks will gain steam, thanks to rising interest rates and smaller tax bills courtesy of tax reform. Normally, gains like these mean it’s too late to get in. But there are still many signs that the big banks (again, with the exception of Wells) have room to run. Let’s take a look at 3 of these buy signals. Then we’ll dive into that 7.4%+ payer I mentioned off the top. One clue that the banks have upside is in the performance of the sector as a whole, as tracked by the Financial Select Sector ETF (XLF). As you can see below, XLF trails S&P 500 year to date, with the two benchmarks really parting ways in late May. That divergence marks the start of our buying opportunity. And you can see that the strong earnings we’ve seen in the last couple weeks have caused XLF to narrow the gap, if only slightly. You can expect that chasm to keep closing as the Fed hikes rates. Next, let’s take a peek at the banks’ price-to-earnings ratios. But we’re not interested in past profits; the forward P/E—or the multiple to projected earnings—is more useful. 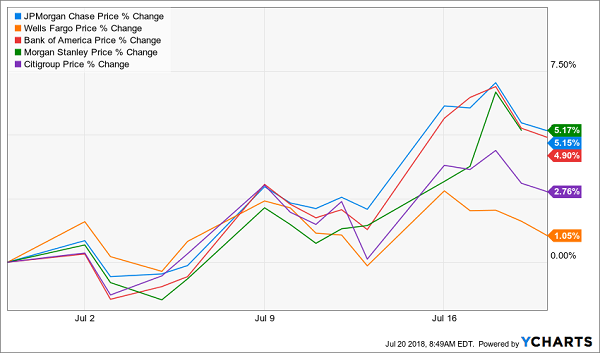 Yet even though our 5 major banks have beaten the market over the past 5 years, with an average price gain of 76% vs. 67%, that’s nowhere near the upside they should have gotten from their dividend hikes alone. Remember, as I wrote in a June 1 article, stock prices generally rise in lockstep with dividend hikes. That means our 5 stocks have a long way to go before they “catch up” to their recent payout hikes, let alone those still in the pipeline thanks to soaring bank earnings. The takeaway? Our buying opportunity is still very much alive. But as I told you earlier, our best avenue to safe, cash profits isn’t through traditional bank stocks. Instead, we’re going to, er, bank our bank profits through preferred shares. Most investors only consider “common” stocks when they look for income. These are the shares in a company you get when you place an order with your broker, such as stock in banks like JPMorgan Chase & Co. (JPM) or Bank of America (BAC). Preferreds are wonderful hybrids that offer aspects of both stocks and bonds. They can trade on an exchange just like any common stock, but they trade around a par value and dole out a set regular payment, just like a bond. Their biggest appeal is their excellent payouts. Many yield upwards of 6%. However, preferreds are an obscure corner of the market, so instead of venturing out on our own, we’ll buy them through a closed-end fund (CEF) run by a top-flight preferred-stock pro. The other advantage of buying through a CEF is that these funds juice our dividend yields even higher and hand us more upside, too! To explain how, let me introduce the preferred-stock CEF I want to show you today. 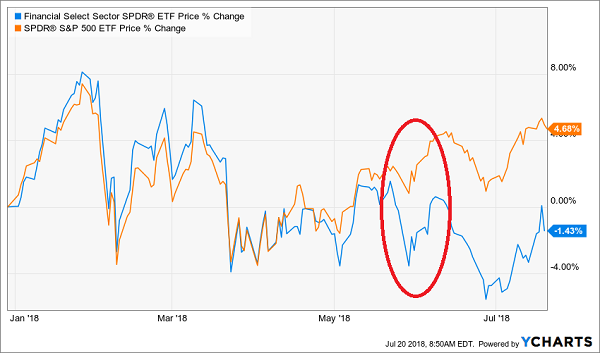 Financial stocks issue more preferred shares than any other sector, and you can see that in the Flaherty & Crumrine Total Return Fund (FLC): financials (including banks and insurance companies) occupy 81% of the fund’s portfolio. The other thing we see right away: FLC’s 7.4% dividend, which drops into your account monthly—just as your bills come in—instead of quarterly. That’s a nice added bonus that doesn’t exist in “regular” bank stocks. How does management do it? For one, just by holding preferred shares instead of common stocks, FLC is goosing its income dramatically. And second, the seven-person squad at the top amplifies FLC’s dividend income (and the portfolio’s upside) further through a modest amount of leverage (32.9% of the portfolio). If you hear the word “leverage” and start to feel queasy, don’t worry; this is where that expertise I hinted at earlier comes in: Flaherty & Crumrine was founded for the sole purpose of profiting from preferred shares way back in 1983. With CEFs, the key figure to watch is the difference between the fund’s market price and the value of the assets in its portfolio, known as the net asset value, or NAV. The bottom line? When this unnatural discount vanishes, we’ve got 7.7% price upside baked in from today’s level. 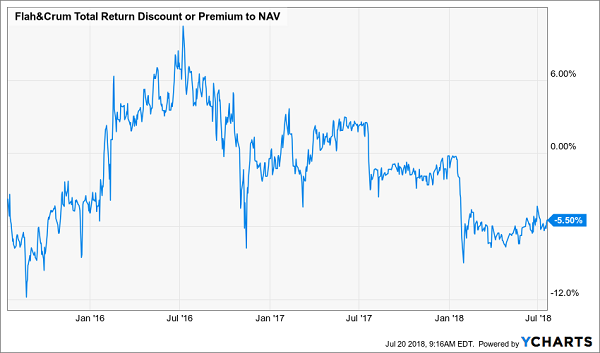 And if it goes to a 2.4% premium (its highest level in a year and still well short of its all-time peak of 8.4%), that gain jumps to 9.1%—in addition to FLC’s 7.4% dividend. That’s the kind of punch a weirdly underpriced CEF like FLC packs … and it’s why FLC is a better way to profit from a bank rally than “regular” stocks. 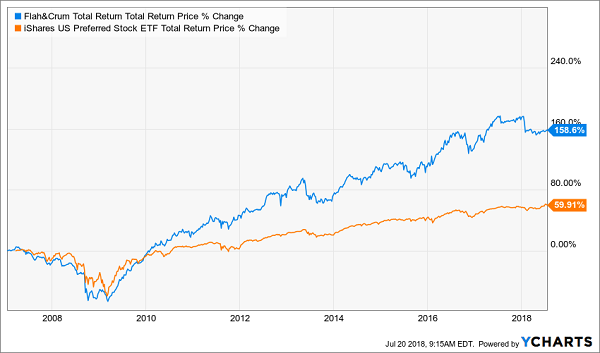 The best part is, you don’t need to stick to one sector (banking, in this case) or one asset class (preferred stocks) to find the 7%+ dividends you need to secure a happy retirement. The truth is, there are safe 7%+ yields in just about every sector you can imagine—real estate, health care, infrastructure, you name it. But you won’t hear about any of these dividend plays from your advisor or the talking heads on CNBC. That’s because it takes just a little more research to find these hidden gems, and the shooters on Wall Street would rather stick to the popular names of the S&P 500—or blather on about the latest Apple (AAPL) iPhone sales, or how many cars Tesla (TSLA) is cranking out these days. They don’t care. They get paid either way! This is exactly why I assembled my 8% “No-Withdrawal” retirement portfolio. It’s a batch of 6 investments from across the market—real estate investment trusts (REITs), CEFs, preferred shares and more. As the name suggests, these 6 buys give you a safe (and growing) 8% dividend. That lets you lock in a solid $40,000 income stream on a $500k nest egg—enough for many folks across the US to clock out of the workforce and live without having to sell a single stock in retirement. All on $500k … less than half of what the suits on Wall Street say you need! 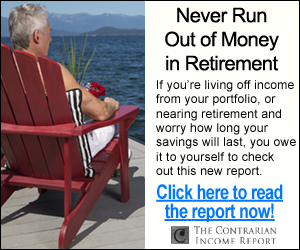 The 6 surprising buys in my “No-Withdrawal” retirement portfolio are waiting for you now (they’re just a couple clicks away! ), and I can’t wait to show them to you. 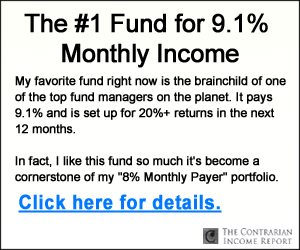 Simply CLICK HERE and I’ll give you everything I have on these 6 “no-drama” income plays, including their names, ticker symbols and buy-under prices. Don’t miss out!